The overarching aim of the CarboEurope-IP is to understand and quantify the terrestrial carbon balance of Europe and associated uncertainties at local, regional and continental scale . ”The European Carbon Balance” What is the carbon balance of the European continent and its geographical pattern, and how does it change over time? ”Processes and Modelling” What are the controlling mechanisms of carbon cycling in European ecosystems? How do external parameters such as climate change and variability, and changing land management affect the European carbon balance? ”Detection of Kyoto” Can the effective CO2 reduction in the atmosphere in response to fossil fuel emission reduction and enhanced carbon sequestration on land be detected in the context of the Kyoto commitments of Europe? To determine the time-varying distribution of atmospheric concentrations of CO2 and other Carbon Cycle related tracers by taking high precision measurements as input to top-down inverse modelling techniques (MO1). 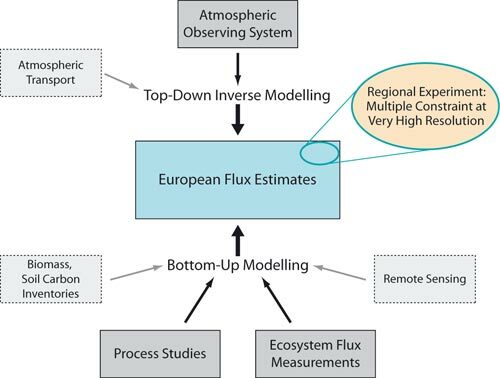 To determine net ecosystem carbon fluxes from eddy covariance towers, changes in carbon pools from land carbon inventories, and biophysical parameters from remote sensing as input to bottom-up process modelling (MO2). To develop an innovative data assimilation framework for the application of a multiple constraint approach where observations of different nature will optimally quantify the European carbon balance (MO3). To determine the partitioning of carbon fluxes into its constituent parts (assimilation, respiration, fossil fuel burning), at local, regional and continental scales and its relation to external parameters, and present human activities (MO4). To quantify the effects of management on net ecosystem carbon exchange based on data synthesis (MO5). To develop, evaluate and optimise ecosystem process models (MO6). 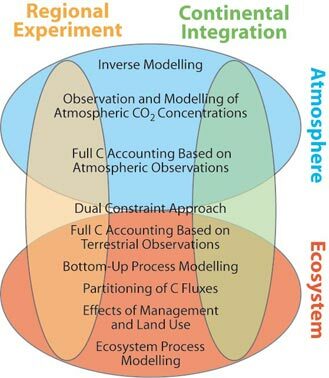 To provide an observation system of atmospheric measurements and a modelling framework to detect changes in atmospheric CO2 concentrations during the time frame of a Kyoto commitment period (MO7). To develop the outline of a carbon accounting system for the second Commitment period based on measuring carbon fluxes, stock changes by soil and biomass inventories, vegetation properties by remote sensing, and atmospheric concentrations (MO8). a Continental Integration Component (Component 4) that merges the various data streams into a comprehensive assessment of the European carbon balance. All these Components interact and require additional cross-cutting information. The joint aim is to estimate the European carbon balance in the recent past and present (Figure 2). The objectives of these Components as based on the Main Objectives are listed below. In order to meet the Main Objectives, the Components are assigned to meet Specific Objectives. We refer to the linkage with the Main Objectives (MO) in brackets. Means to achieve the Specific Objectives are given for each objective.